The Terraco Exterior Insulation Finishing Systems consist of a range of different components applied in a specific sequence. Adhesive - Terraco Styrofix is used to “glue” the insulation board to the exterior wall surface. 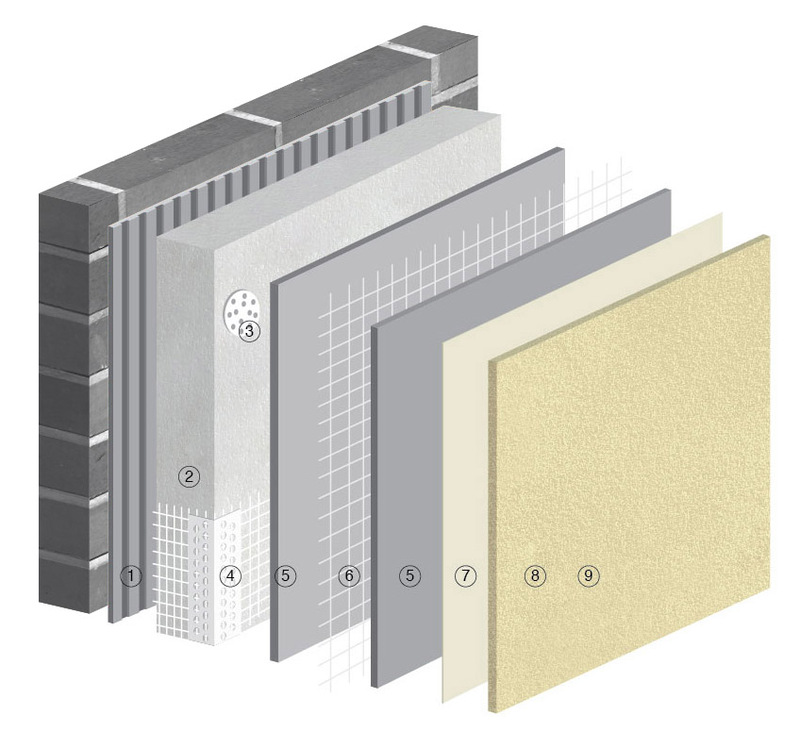 Insulation Boards - An EIFS insulation material (EPS, G-EPS, XPS, MW) which is secured to the exterior wall surface. Mechanical Fasteners - Also known as dowels, to fasten the insulation board to the exterior wall surface. System Profiles and Accessories - These items are required for strengthening and finishing the system, such as around openings. Basecoats - Terraco Styrobond basecoats are applied on top of the insulation material and reinforced with EIFS glass fibre mesh and system profiles. EIFS Grade Glass Fibre Mesh - Terraco Terramesh is used to reinforce the system against impact. Primers - The type of primer used varies depending on the type of decorative finish coat to be applied. Decorative Finish Coats -These Decorative Finish Coats are applied on top of the base coat giving a decorative, durable, crack-resistant finish. Topcoats - Sometimes applied over the Decorative Finish which may include a clear or a pigmented topcoat. Note: Please remember that for sheathing (plywood or OSB substrates) which require suitable drainage systems, the use of Terraco Weathercoat Waterproofing is required to be applied to the substrate prior to commencing with the installation of the EIFS drainage system.